Learn, progress, evolve and most of all have fun on a Freediving Course with us! We offer the best in Freediving courses and training in South East Asia. Whether you are freediving for the first time, or are an experienced diver, our programs will help you set and achieve your goals and explore your potential! Our Instructors are both recreational and competitive Freedivers themselves who aim to share their passion and expertise with you. As competitive Freedivers, our Instructors are constantly exposed to the latest in deep diving, training and teaching. We believe in teaching from experience, guiding students to places we have been before ourselves. Freedive Gili courses balance the athletic and yogic approach to the sport of Freediving. We recognize that freediving is a personal expression of underwater exploration and for some that means diving as deep as possible, for others interacting with marine life. We provide a safe environment and trustworthy, experienced instructors for you to take your diving to the next level and surprise yourself with what is possible. At Freedive Gili, warm tropical water and great visibility help to increase your comfort in the water and confidence in your ability. Rather than only focusing on technique and skills we always incorporate “fun freedives” into our courses so you can enjoy everything you have learned while exploring the reef and exotic aquatic life. And, once you have completed your course you will find that you can explore the same reef on one breath as you can with a tank! We teach SSI Freediving courses from beginner to instructor levels, as we believe it offers the most up to date material, quality and professional service available. 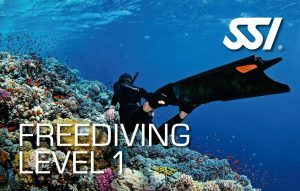 The SSI Level 1 Freediving course is an introduction to the purest form of diving. Here you will learn the proper breathing techniques, familiarize yourself with diaphragmatic breathing and take a deep breath like you never have before. 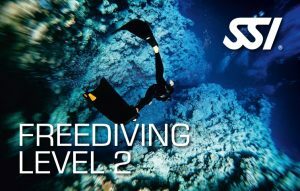 In the SSI level 1 Freediving course you acquire proper skills and knowledge to partake in Freediving to depths of 20 meters in the most relaxed and safest manner possible. You will develop skills necessary to train your body to be more efficient with oxygen, gain better respiration and muscle flexibility and learn new skills to take your freediving to the next level. 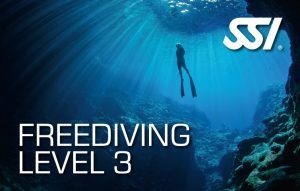 The apex of the SSI Freediving training program, Level 3 will take you to depths of 40 meters. Freediving well below the residual volume of the lungs, this is the specialist deep freediving course and will equip you with the proper knowledge to take you into the deep blue and beyond.